Five room keys from the Tourist Hotel Port Macquarie. 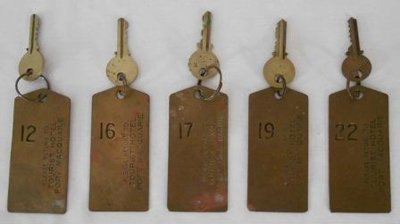 Each key is attached to an individual large brass key tag with small metal key rings. 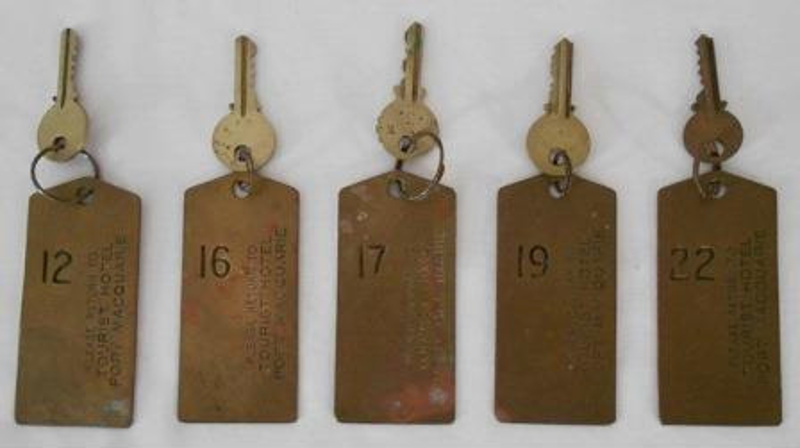 The key tags are numbered 12, 16, 17, 19 and 22 and inscribed on one side 'PLEASE RETURN TO/ TOURIST HOTEL/ PORT MACQUARIE'. The Tourist Hotel was once Port Macquarie's premier accommodation and dining venue. It accommodated many visiting celebrities and was the venue of choice for important Municipal and community dinners. The Horton Street hotel was originally the Commercial Hotel. It was refurbished in 1936 and renamed the Tourist Hotel. Renovations to the 42 room hotel included tiled bathrooms and lavatories and hot and cold running water to wash basins in each bedroom. The Tourist Hotel was later replaced with the Innes Tavern which opened in 1973.